Here you get carefully prepared another Set of 10 MCQ practice questions (Q.No.11 - 20) in our each Test Series with hints & solutions (given at the end) from the Physics chapter - Work, Energy and Power. Work done by a constant force and by a variable force, Unit of Work, Energy and Power, Work Energy, Theorem. Elastic and in-elastic collisions in one and two dimensions, Notions of Work and Energy, Law of Conservation of Energy, Potential and Kinetic Energies, Gravitational Potential Energy, and its conversion to Kinetic energy, Potential Energy of a spring. Conservative and Non-conservative Forces, Different forms of Energy, Three types of Equilibrium, Mass-Energy equivalence. Power. 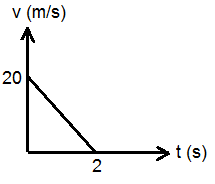 Question 11: The potential energy of a particle varies with distance ‘x’ as shown in the graph below. 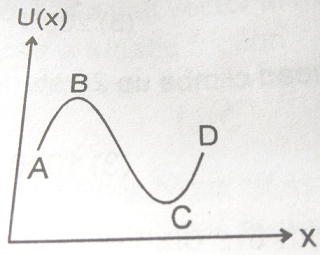 Answer 11: c. (dU/dx = 0 at B & C). Answer 12: a. Answer 13: d.
Answer 15: d. Answer 16: a. Answer 17: d. Answer 18: b. Here you will get carefully selected 10 MCQ practice questions in our each Test Series with hints & solutions (given at the end) from the Physics chapter - Work, Energy and Power. All these are typically important questions for NEET-UG, JEE Main & Advanced (IIT) AIIMS, JIPMER, COMEDK, WBJEE, MBBS Admission Tests, Engineering Entrance Exams, NEST and other such competitive exams. Work done by a constant force and by a variable force, Unit of Work, Energy and Power, Work Energy, Theorem. 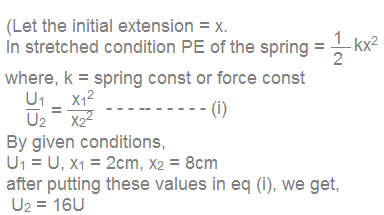 Elastic and in-elastic collisions in one and two dimensions, Notions of Work and Energy, Law of Conservations of Energy, Potential and Kinetic Energies, Gravitational Potential Energy, and its conversion to Kinetic energy, Potential Energy of a spring. Conservative and Non-conservative Forces, Different forms of Energy, Three types of Equilibrium, Mass - Energy equivalence. Power. c. 6.26 m/s d. 98 m/s. Question 5: A body loses half of its velocity on penetrating 6cm in a wooden block. How much will it penetrate more before coming to rest? Answer 1: a. (Hint: Among four diagrams in this diagram, ‘U’ is minimum for some value of ‘r’). Answer 2: c. (W = 20 x 10 x 20 x 0.25 = 1000J) Answer 3: d. Answer 4: a. Answer 5: b. Answer 6: a. Answer 7: a. Answer 8: b. Answer 9: b.